Show off your love for dice gaming. 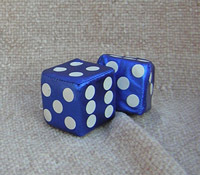 A classic pair of hanging dice will accent your vehicle. They are plush and come in colors of blue, red, silver, and gold. Measures 2 1/4" square each.